Retro is trendy. A lot of people buy vintage clothes or antique furniture. It’s no surprise then that we see more and more retro fridges in kitchens around the world. These refrigerators act as real eye-catchers because of their funky colors and unique design. It doesn’t matter if you have a contemporary kitchen or a very modern one; retro fridges fit anywhere. If you’re planning on buying a retro fridge, you should check out these 5 gorgeous models. Big Chill has a great collection of retro refrigerators. They combine a vintage old-school look with modern technology. All their models have a stamped metal body, authentic chrome trim and they’re frost free. If you want you can check the ‘interior ice maker’ option box. A fridge doesn’t get more retro than this. Actually, this is no surprise if you company is called ‘the vintage fridge company’. 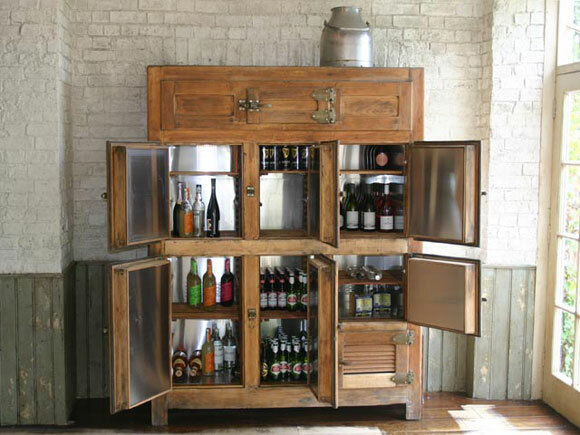 They are specialized in the refurbishment and supply of vintage refrigerators. All of their models are fully guaranteed and can be shipped worldwide. You’ll find more information about the renovation process and the company. 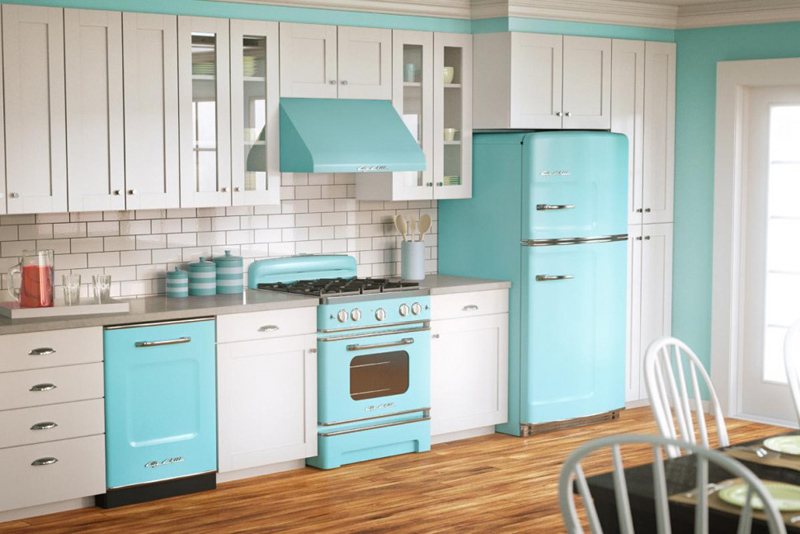 If you can’t get enough of the 50’s, this fridge is a must-have! The exterior might look like it’s more than 50 years old, but the interior has all the latest technology for a top performance and high levels of energy efficiency. 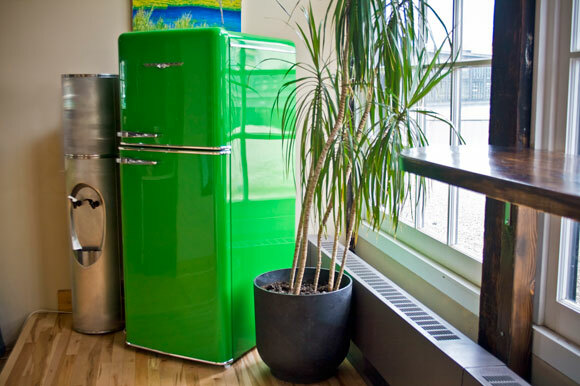 These retro fridges comes in 10 different colors; from a subtle cream to lime green. Every model also has a small icebox for convenience. Great news for small appartmenta and offices: Smeg has as well compact model shown here in red color. You can get more information about the Smeg fridges on their. 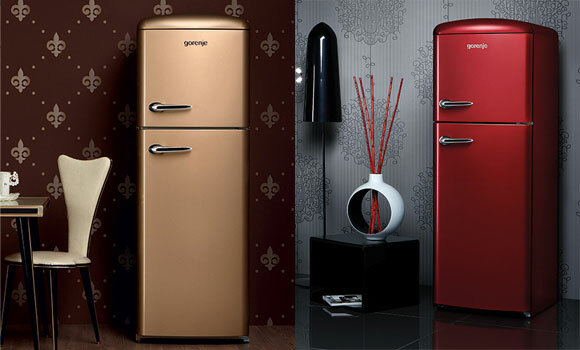 These Gorenje fridges are the perfect combination between old and new. They would fit in a modern kitchen as well as in a more classic kitchen. They come in every color imaginable. Simple black or vibrant orange… the choice is yours. The Northstar line from Elmira is a perfect fit for a contemporary or modern kitchen. You can choose between 9 pre-determined colors or create your own. And just like all the other models on this page, they have a vintage look on the outside but all the latest tech on the inside. Want to know more? Read article about retro kitchen.